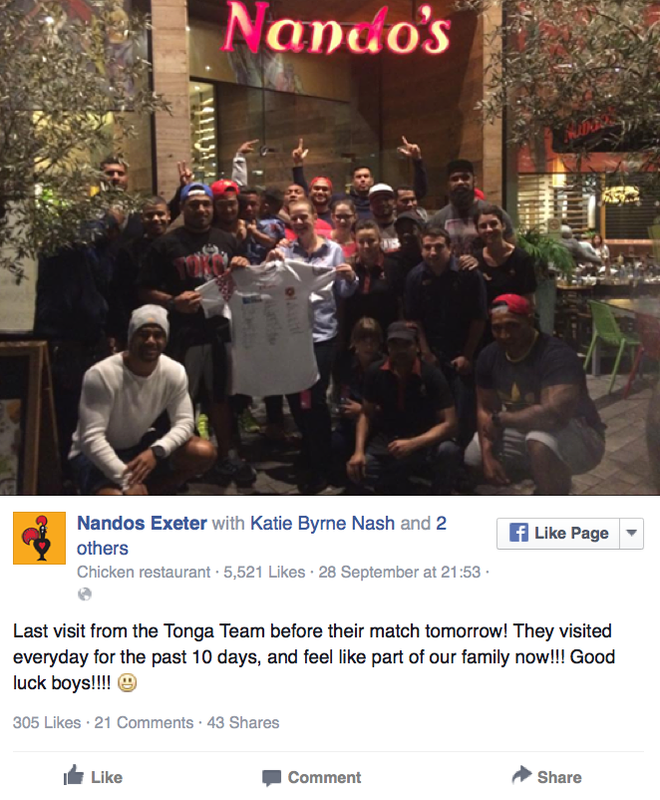 Sportsmen are known for their strict diets and habitual meals before games, but the Tonga team at the Rugby World Cup have been frequenting a branch of Nandos during their stay in Exeter. Monday marked the tenth day consecutive day that the team had packed into the chicken restaurant and all that protein seemed to pay off, as the Pacific islanders saw off Namibia on Tuesday. The team presented staff at the restaurant with a signed shirt on their tenth day, which will take pride of place on the wall soon. Tonga bounced back from their opening weekend loss to Georgia by defeating Namibia at Sandy Park on Tuesday. Telusa Veainu and Jack Ram both dotted down twice as Tonga crossed the whitewash five times to keep their hopes of progressing from Pool C.
But with their remaining two matches being played in Leicester (against Argentina) and Newcastle (against New Zealand) chances are they’ll have to find another branch of Nandos to hit up.